Low budget post-apocalypse cult action movie in which crazed outlaw bikers roam a devastated Australia with only a few law enforcers in souped-up V8s to stop them. 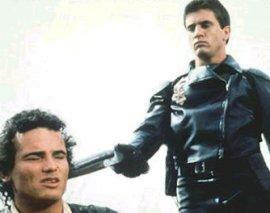 A much younger Mel Gibson in an early role stars as Mad Max. (In fact the film was re-dubbed with American voices when the film was first released in the States!) There's some amazing stunts (despite the small budget) as renegade law enforcer Max avenges his wife and child's murder by such a gang. Followed by two sequels (Road Warrior and Mad Max Beyond Thunderdome), this film spawned countless imitators - amongst them the enormously expensive Waterworld. Read an extended review of Mad Max.